Yaoundé (Agenzia Fides) - "They threatened that they’re going to kill us", said His Exc. Mgr. Michael Miabesue Bibi Auxiliary Bishop of Bamenda, in the English-speaking part of Cameroon, who was detained twice this month by armed groups. On 5 December he attempted to travel from Bamenda, the capital of the North West region, to Kumba, 170 kilometres to the south west, intending to celebrate mass. However, on the road near Batibo his car was stopped and held up by a group describing itself as the “Amba Boys”. "They saw that I was a Roman Catholic bishop, but they were not willing to listen to me, they demanded my phone and the phones of my driver and his brother", said Bibi. 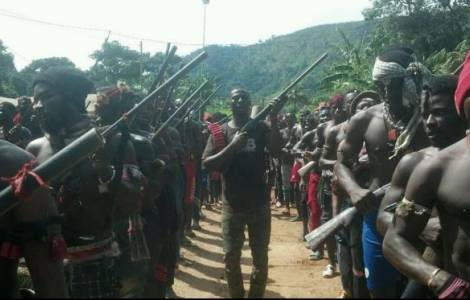 The next day the bishop once again encountered an armed group on the road towards Buea. Bibi was due to celebrate mass on 7 December. He had been warned that a group of nuns also had difficulties on the road. They were stopped by the Amba Boys and consequently arrived late for a church service. Nevertheless, Mgr. Bibi went ahead with his journey because he was "doing missionary work". The armed separatists said the bishop should not be travelling owing to the “ghost town” protest that was in force for the day – travel was prohibited. "It was actually scary", said Bibi, describing how the armed group kept him for the second time in the forest, this time for four hours. They said he was “breaking the law” for travelling that day given the stay-at-home protest intended to paralyse the area. "Finally by the grace of God they liberated us", says Bishop Bib. On this occasion, the local leader of the Amba Boys ordered his men to give back the Bishop's telephone and let him continue his journey.